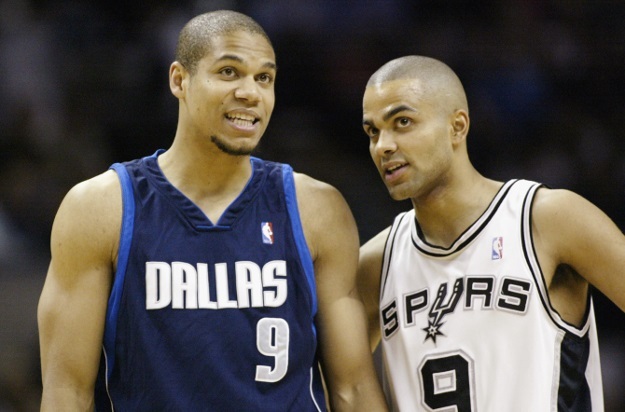 Abdul-Wahad (left) and four-time NBA champ Tony Parker. If you’ve become an NBA fan in the last 20 years or so, it might be difficult to imagine the league without the presence of players from France. In the midst of the 2015 stretch run for the playoffs, the NBA’s French legion features four-time champion and 2007 Finals MVP Tony Parker, reigning Defensive Player of the Year Joakim Noah, 2014 champion and 2006 Most Improved Player Boris Diaw, and 22-year-old Utah Jazz prospect Rudy Gobert, who is currently fourth in the league in blocked shots. But it wasn’t too long ago — 1997, in fact — when the NBA didn’t have any French players. That changed at the ’97 Draft when the Sacramento Kings used the 11th overall pick to select Tariq Abdul-Wahad (f.k.a. Olivier St. Jean) out of San Jose State University. Abdul-Wahad, who converted to Islam that same year, went on to play six seasons in the league with the Kings, Magic, Nuggets and Mavericks while averaging 7.8 points per game. When he entered the league he was the NBA’s first-ever French player; by the time he left, a couple handfuls of his countrymen were making a significant imprint on the pro game. Today, Abdul-Wahad coaches the boys basketball team at Lincoln High School in San Jose, Calif., and is the co-founder of the San Jose-based BlueSox AAU program. What was your first reaction upon hearing the news of the shootings in Paris? Tariq Abdul-Wahad: Surprised and shocked like everyone else, I guess. Anytime innocent people lose their lives, there is always a shock factor. One never gets used to it. Whether it be in France or anywhere else. Life is sacred and it should be celebrated, not destroyed. Our thoughts and prayers must go out to the innocent victims of these tragedies. How can something like that happen? TAW: I have no idea. I am not an expert on violent interpretations of my own religion. I don’t understand Islam that way, where you go kill someone who insults you or your religion. We have countless stories in our tradition of our prophet being mocked, ridiculed, abused and attacked. His consistent behavior was one of peace and patience never of retribution. In his time, they did much worse than drawing cartoons. So to be honest, I don’t really get how a Muslim can come to this understanding of his or her religion. As far as I am concerned, to do something like this in the name of any religion is crazy. Especially when you are a Muslim citizen of a country that protects your rights to practice your religion and where, even though inequalities might exist, protects your right to exist. There’s an article from Kareem Abdul-Jabbar at Time Magazine talking about how it gets a little old for him to explain over and over again that these terrorist attacks are not about religion. Is it the same for you? TAW: Mr. Kareem Abdul-Jabbar is onto something. These despicable outbursts of violence have more of a political overtone than a religious one. They are completely removed from spirituality and love. When I think religion, any religion, I think love, mercy, being better; not killing innocent people. That said the sociopolitical maze that creates individuals capable of such crimes have very little to do with the nature of their religion but more with their actual ignorance or lack of understanding of it. So yes, it is sometimes tough to have to explain that Muslims are not all indoctrinated fanatics. How did you feel about the depiction of Mohammed in the Charlie Hebdo magazine? Did you feel offended? TAW: I had not seen the depiction of the prophet Mohammed in Charlie Hebdo until now, when I saw some of the cartoons on social media. What I have seen is not surprisingly tasteless. But I guess they’ve been tasteless about many issues over the years depicting religions in general in a very negative light. So no one should be surprised or offended. It is what they do. Are you OK with Charlie Hebdo or any other media outlet having the freedom of speech to be offensive to your religion or others? TAW: Of course I am OK with them having the right to be offensive to anybody. I actually have to fight for their right so I can enjoy my right to say that their cartoons are incendiary and tasteless. How’s the acceptance and understanding of Islam in France compared to the United States? TAW: That question should be answered in a PhD dissertation. But as far as I can understand, it seems that many Western countries are moving politically further to the right, which does not bode well for minorities and people of color whether it be in Europe or elsewhere. Muslims are an integral part of French society. Muslims helped rebuild the country after the wars, fought for it, liberated it, and some even died for it. As long as the history of the Muslim presence in France is going to be obscured and hidden from the population, there will always be the impression that Islam is some kind of enemy. If you add the fact that France has a fairly dark past when it comes to its colonial history, it’s obvious that misunderstandings will occur when it comes to Islam’s presence in France. To add fuel to this situation you have a growing Muslim population that already reaches around 10 percent of the overall French population. In America, it is a bit different. Freedom of religion is one of the premises on which the country was founded and the majority of Muslims here are very active in protecting their rights and the rights of others. Having a clear voice and clear message as to what American Muslim values are about has been in the forefront of many American Muslim organizations such as CAIR or ISNA. But it does not mean that misguided lunatics won’t strike. Let’s not forget Boston. Unfortunately, these situations cannot be read intelligently without looking at the global picture of Afghanistan, Iraq, Syria, Palestine, Nigeria, etcetera… Geopolitical matters are now like the stock market – globally interconnected. The only thing I can hope for as a human being today, especially for my children’s sake, is that people find ways to talk to each other rather than resort to senseless violence. There seems to be a movement to say I Am Charlie in support of the magazine and its victims. I saw something on social media that would reflect my position more accurately: I am not Charlie because I believe in respect, I am not a terrorist because I believe in peace. Why do you think so many people look at Islam in a negative light? TAW: Islam is arguably the fastest growing religion in the world. Many of the armed conflicts today are taking place in Muslim countries or regions, so we often hear of Muslims fighting others or fighting each other. Islam is not well-known by non-Muslims in the West. The media needs to inform but also increase viewership and Islam is the perfect boogeyman. Terrorist attacks in the name of Islam are happening the world over. Some of these elements make it very easy for the general perception of Islam to be negative. It’s our mission as Muslims to do a better job in educating ourselves and show who we truly are because the vast majority of our population worldwide is peaceful and peace loving. But I guess right now the worldwide Muslim community is in this perfect storm. Would you say there’s a disaffection from French Muslim people to the concept of France? TAW: Right now, the French Muslims are obviously in this storm. But I’m confident they’ll find a way to continue to show that they are a positive influence in French society. Unless, of course, political parties decide to turn them into the scapegoat to hide the real issues plaguing the country. I believe that either way Islam will exist in France and the dialogue between the country and the faith will continue to unfold no matter how awkward it might be at times. It would be great if more accomplished and well-known Muslims like Abdul-Wahad were given platforms by mainstream media outlets to speak about the religion and what so many of its followers really believe. Anti-Muslim bigots and Islamophobics like to claim the Muslim community stays silent on incidents like the Charlie Hebdo shooting — which is wholly untrue — but it would be impossible to hold onto that belief if prominent names like Abdul-Jabbar, Abdul-Wahad and others were constantly on TV and in the newspapers offering a balanced Muslim perspective.